This modernist teen room will best respond to the emotional and mental state of your child. 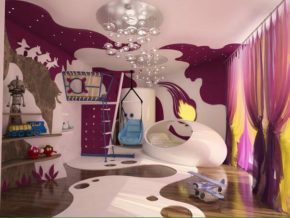 The particular age at which the child crosses the threshold from childhood to youth and maturation, in such an anxious, sensitive and imaginative age, the design of the room will satisfy his needs of freedom of fantasy. Numerous lamps, colorful curtains through which penetrates yellow and pink light, the decorated ceiling and walls, the egg-shaped bed as if you are in a small space capsule, and the figures on the floor will take you to the world of fantasy where there is still room for planes and robots where gameplay and imagination go hand by hand. Maybe, this is a room for soul-dreamers or future inventors. The room and its decoration will stimulate the development and growth of your child and he will feel free and happy in it.